On Saturday morning, I attended one of lululemon’s free yoga classes with my friend, Lauren (“the perfect way to start the weekend!” as she pointed out). Imani Zito, founder of Alchemy Juice Bar Cafe in Hartford, taught both the yoga class and the raw food demonstration that followed it. With very soothing energy and a warm presence, Imani made us feel as if we weren’t at a studio but rather at home with her, in her living room. She gives you that feeling that somehow you’ve known her for a very long time. Since there were a number of children in the class, Imani customized the class and made it playful. One of my favorite parts of her yoga sequence was the transitions we did from Crescent Pose to an intense side stretch (roll onto the extended leg’s hip and hug the opposite leg’s bended knee) to Pigeon Pose. When it came to the raw food demonstration portion of the class, I was slightly skeptical. Chia seeds and almond milk? How would that taste? As it turns out…delicious. Imani showed us how to soak raw almonds in purified water, blend and strain them to make almond milk. 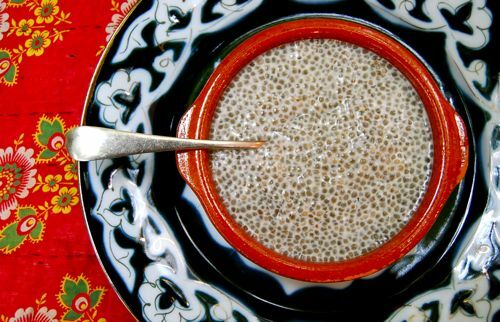 She then mixed in about 2-3 cups of chia seeds which expanded in the milk to make a delicious tapioca-like pudding. I was so inspired by Imani’s demonstration that I immediately went to Whole Foods and bought myself some ingredients to make my very own “lunch smoothie.” Since cost is always a concern for me when it comes to food, I should mention that the chia powder I bought cost me approximately $12. Was it worth it? Yes. I now mix my chia powder in my smoothies and cereal for an extra antioxidant boost in the mornings. To try one of these delicious smoothies, look inside your fridge. I’ve done a lot of variations of the one below (substituting kale for bananas). Give it a shot and get creative! Mix everything together in the blender and serve immediately.